As I type this it's half term and the weather is miserable outside. It can be hard to juggle everything at once sometimes, especially when you are cooped up indoors with two young children who both need so much of your attention. That's where our tablet and the iPad comes to the rescue. I think with moderation they can be excellent not just for entertainment but for learning too. This half term I've found myself encouraging Noah to play quietly on it for half an hour in the afternoon whilst I attempt to get Ava to nap upstairs, though my efforts are usually futile because she doesn't sleep! With this in mind I'm always looking for new and exciting apps and games for Noah to try out and there’s a lot to celebrate in the Little Kingdom, with two brand new apps, Magic School and Big Star Fun, available to download now! 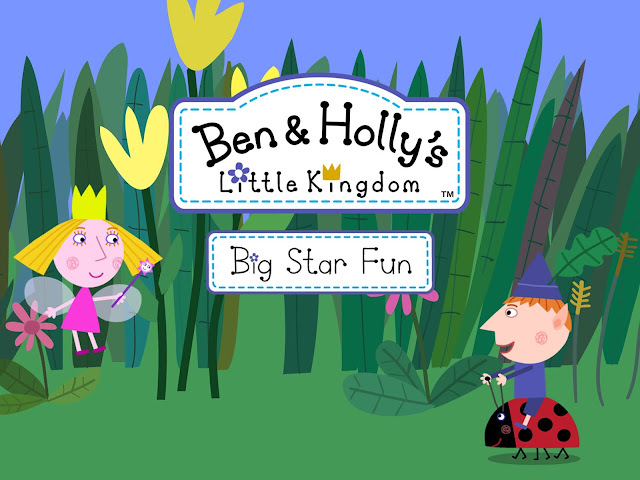 In BIG STAR FUN your little ones can join Princess Holly, Ben and Gaston as they fly through the Little Kingdom! There are 4 interactive games with different difficulty levels that young players can enjoy - plus a special reward STICKER BOOK! Featuring the popular characters and music from the much-loved TV show - this enchanting app offers children a fun and interactive experience they can enjoy time and time again. Available to buy here on both Apple and Android. 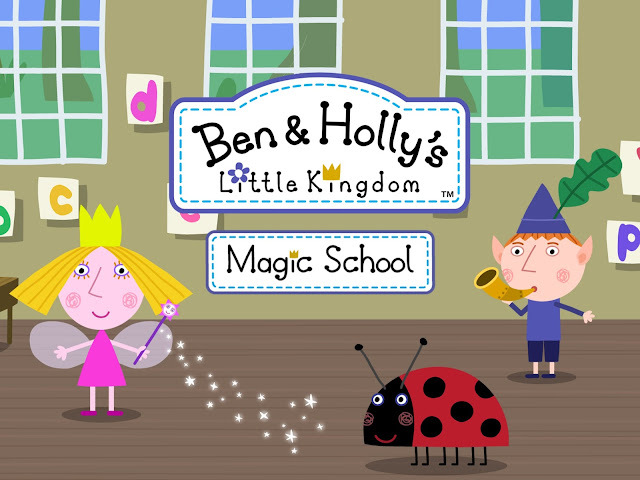 Budding little Elves and Fairies can now join Ben and Holly at MAGIC SCHOOL! In this app they learn magic through a variety of creative and magical games, where they can graduate and earn their very own Magic Certificate. Fun activities include: Wand Creator, Wand Practice, Potion Making, Magic Picnic, Box of Burps, Magic Jelly and End of School Photo. With in-game instructions and encouragement from Nanny Plum, Ben & Holly's MAGIC SCHOOL is guaranteed to offer hours of magical mayhem and fun! Available to here but for Apple only. To celebrate the launch of these two fantastic apps I've teamed up with P2 Games to give away a Kindle Fire Kids worth £99.99 to one lucky winner. Not only that but there will be 10 runner ups who will each win a copy of the Big Star Fun App too! What are you waiting for? To enter all you need to do is use the Gleam form below. Good luck and don't forget to enter my other blog competitions! 1. 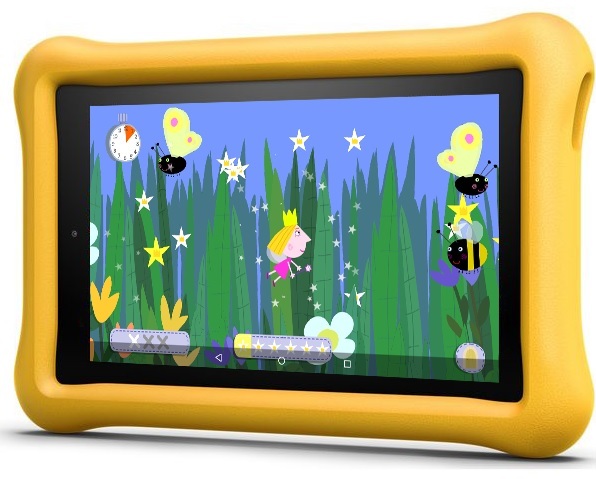 There will be 1 winner who wins the Kindle Fire Kids & App then 10 runners up of the App. I am a huge fan of Ben and Holly and so is my daughter, i like the fact they are not only fun but interactive! My children love Ben & Holly. They would love this! I think The Big Star fun app would be best for my Granddaughter as she is only 4 so I feel this would help her more & he fact she would earn rewrd stickers would keep her motivated. I like the sound of the sticker reward book. My daughter loves stickers. Love the magic theme and rewards. Earning certificates is great for task oriented little ones like my daughter! the magic school sounds fun! The box of Burps in the Magic School sounds interesting! I like the sound of the magic school app as it sounds lots of fun making wands and creating potions. I like the sound of Magic School, My daughter loves to be creative and I think she would find this really fun! I like the sound of the magic school app, educational an fun! This would be perfect for Ava! She currently has games on my phone which is a pain as she always draining the battery. She'd love Magic School! My 4 year old granddaughter is a huge fan of Ben & Holly. We could learn lots of magic and hopefully magic away the rain! Typical school holiday weather! The potion making would make my granddaughter VERY happy! I love that they can earn rewards and learn whilst playing. The Magic School sounds best - fun but educational. I think magic school sounds good and fun compared to the other apps. My little one is only 14 months old but she's already a total bookworm, especially loving interactive book (pop-ups, sound buttons etc). The Big Star App would be great, every child loves to be recognised for their achievements! I like the sound of the sticker reward book, rewards work really well with my little girl. The Ben & Holly App looks amazing. I love that the child learns whilst playing. Magic Picnic sounds perfect for the summer! Everyone loves making magic, so it would have to be the Magic School. Magic school sounds like so much fun my two would definitely love it they like ben and holly but getting to make magic themselves would definitely keep them entertained!The fact Nanny plum encourages them sounds perfect! LOVE the idea of the sticker reward within the app.....learning & motivating at the same time. Great for developing little minds in a creative way. I like that they are encouraged by Nanny Plum (much better than boring computer voice). The reward sticker book sounds fun! Potion making! My daughter would love it!! That you can create your own potions at Magic School! I like the sticker reward book. The sticker reward book is a great idea, although I'm sure my niece would prefer the Ben and Holly app! The sticker reward book. Who doesn't like stickers? Magic school sounds like fun! For the grown ups as well! my daughter is in to her magic at the moment, she would love that app. I like the fact that they have different difficulty levels, and a reward. it makes the game fun and rewarding which means engaging! The Magic School sounds fun, my sons would love potion making! I think the Magic School app sounds fabulous and encourages children to complete tasks. I'd love to know what the magic jelly does! This looks like so much fun. Love to have this for the little ones. My little boy loves stickers so it would have to be the sticker reward book. I think my daughter would love the magic school! The Sticker REward and Magic School both sound like something my daughter would love! The reward sticker book sounds great, such a good way to encourage them to do the activities. Sounds fantastic my twins and their younger brother love ben and holly so the sticker book sounds fab..
Magic picnic looks entertaining and will help with observational & memory skills without them even noticing. I like that it includes a reward sticker book as it's a fun incentive. My daughter loves Ben and Holly. We all love Ben and Holly in our house my three your old is obsessed my other two sons always stop to watch it with him. My children and I love to watch Ben & Holly together . They would love this! I really like the sound of the Big Star fun with the reward stickers - My little one is at the stage where he loves stickers as rewards! Magic school sounds fun. I like the idea of a certificate as a reward & encouragement as this makes my son work harder. 'Big Star fun' my granddaughter would love this and would be pleased to receive sticker rewards has her Mommy gives her sticker rewards when she is good at home. The Magic school app sounds amazing!! I think that will be perfect to show my son what school is like whilst keeping him entertained and happy! Magic School sounds great and I am sure my grandchildren would have fun with the activities and enjoy collecting reward stickers! The certificates sound good, My little girl always enjoys getting a certificate, it gives her a sense of achievement. We are also a big fans of Ben and Holly so this fun interactive way to learn sounds great. I am quite bad but they get treats. My little girl has another Ben and Holly game, it must be an old one. Im liking the look of this one, love that there is the "reward" of the virtual stickers because my little girl loves to show me the new stickers she has managed to get. Box of burps sounds fun, kids love a strange noise! My nephew would love the stickers. The fact that they are Ben & Holly is enough for me lol =) Both of my kiddos love them! Those apps would be perfect for keeping my little ones busy - and so much better than those egg opening you tube videos! The magic school one sounds like a lot of fun! 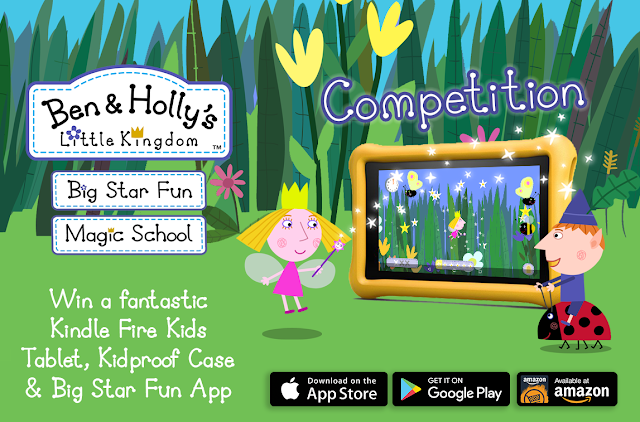 My daughter would love the Big Star Fun App as she loves Ben & Holly, but I like the idea of interactive games with varying levels of difficulty is great, especially as your child develops so the app can stimulate them further. Magic jelly sounds lots of fun and who doesn't like jelly!!! Who doesn't like a bit of potion making! I like the progression and the certificates. It will be a challenge! Milly absolutely loves Ben and Holly and she loves magic! this would be perfect for her! I love the Magic picnic & the certificate. Thank you for the chance! My son Oscar would love this, he loves to watch Ben and Holly! My twins Danny-B and Nevaeh and their brother Tommy and cousin Hope would love this all playing together and a fab app to use a reward chart certainly keep them more focused i think. I think my little one would really like the idea of learning magic! I love that they get to unlock the achievements and earn some virtual certificates! I like the idea of Big Star fun so we can change the difficulty levels and keep it interesting and fun!